Floral print leggings are so popular right now, but not having any appropriate floral print knit in the stash, and wanting a new pair yesterday (isn't that always the case!) am loving my new blue and white geometric version! Have no clue what this fabric content might be as it was recently purchased at the only-open-once-a-month-to-the-public sale at All About Fabrics Warehouse textile outlet and their fabrics are on unidentified, large round bolts located in the area of general fabric content. For instance..... this one was in the section of Stretch Fabrics where there are all sorts of differing 'stretches' of fabrics and clearly different fabric content(s). This is a 4-way stretch and feels like heaven on. 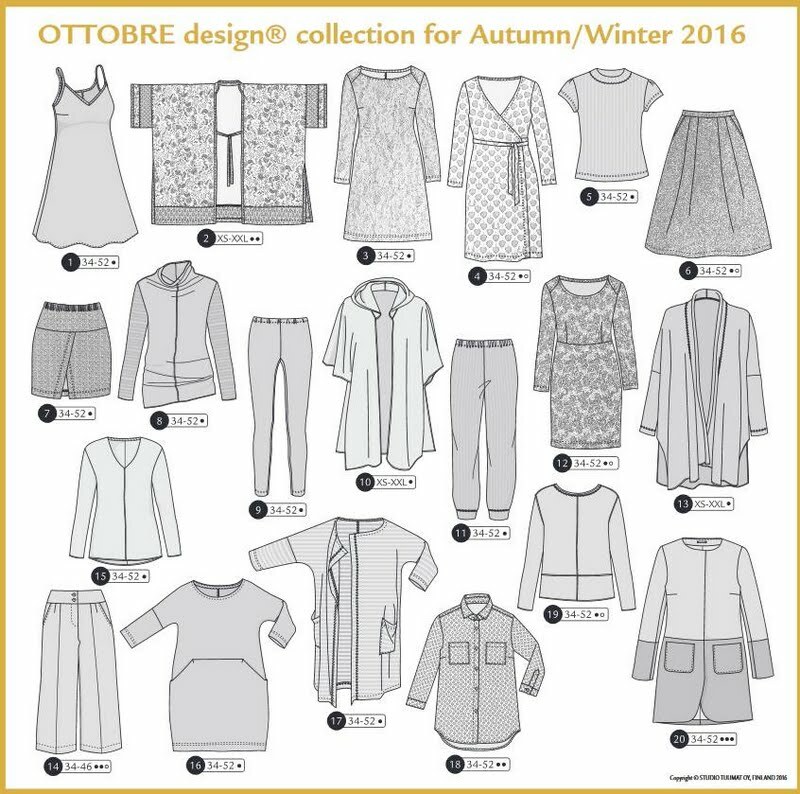 After seeing beautiful Paula's floral one-piece legging on Instagram recently, it encouraged me to re-look at my own one-piece legging pattern I've made many times before, here and here, from Ottobre Design Woman 05/2016 issue. Paula was my inspiration to make this version. 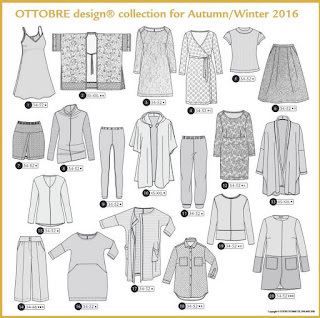 This issue of Ottobre Design Woman was full of great pieces. I've already made 4 of them, some in multiples, and have begun no. 18 shirt, with a collar and buttons, down there at the bottom, out of fluid powder-blue microsuede that, hopefully!, will be able to show you soon. Back to the leggings..... such an easy pattern..... one piece, cut two, and after a couple of hours max, boom, you've got a new pair of leggings. I've worn the others I've made to pieces, particularly the black ones, but it kind of bugged me there were no side seams and sometimes felt they had more of a 'tights' look, than a 'leggings' look and came real close to cutting my pattern in two. Until I saw Paula's gorgeous pair and realized that a side seam would cut a print up and maybe no side seams would showcase a print well. So I left my pattern piece intact and am so glad as I LOVE this pair of leggings so much. Wearing the boxy Burda Sweatshirt with it today. It was an early Spring, gorgeous mild South Carolina day when I took these photos. One couldn't help but feel joyful in the warm, sun-filled air. What a great outfit! Also, I have to say that this color blue looks fabulous on you. This Ottobre legging is one of my favorite patterns to use as well, although I haven't ever made a floral with them. I think I will have to now! Your leggings are really fab and also a mood lifter with the bold design. I was studying the Ottobre picture above...there are some really great designs, no wonder you're smitten. I cant get that magazine here unfortunately. You were (obviously) concentrating on your "jump" rather than your "landing!" You have the lovely, long legs that show off these leggings to their utmost! Love your outfit! I have a pair of floral leggings (b&w liberty rayon & spandex) and really love the oh la leggings by Papercut patterns - I can get such a great fit with all those pieces! Love them. I have another simple pattern which sounds like yours which was given to me at a leggings making workshop. So easy to make and fun with all the stretch fabrics available now. I envy you being so close to the All About Fabrics Warehouse! What a bonanza! Almost scary how crazy one could go in a place like that! I have to start with your last couple of photos - made me laugh. This is probably what would happen to me should I choose to leap about! Your leggings are gorgeous and I love them with your powder blue top. You look absolutely gorgeous! Really cute!! wow, that once-a-month shopping opportunity sounds wonderful. Oh nooo! :D I laughed pretty hard when I saw how graceful you landed, that is what always happens to me too when I try shots like this one, he he. I hope you didn't hurt yourself though! I love the fabric choice! It really matches the pattern. They look great on you. Congratulations! I hope you didn't hurt yourself...What gorgeous fun leggings - they look so pretty with your pastel blue top. Just the right sort of thing to wear for active pursuits - sans hard landings! And so much quicker to run up your own leggings than go shopping for them - such an unpleasant activity!